What do we mean by “Fish in distress”? I’ve been a Fisheries Officer in the Cumbria and Lancashire for 18 years and I’m well aware that summer can be a very busy time for me and my colleagues. We may have to respond to many fish-related incidents during the week, as well as our day to day work to protect and improve fisheries. 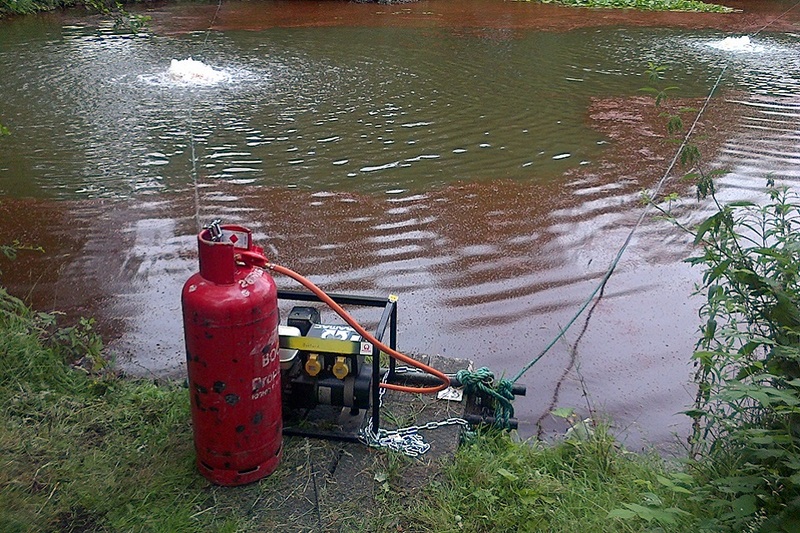 We refer to these incidents as ‘fish in distress’, which may come across as a funny term to some, but during summer when temperatures rise, fish disease is more prevalent and both water and dissolved oxygen tend to be less available - some fish certainly do become distressed! To top it all off, even when it does eventually rain, (and often in the summer this can be torrential rain following a dry period) this may not provide much relief. Did you know when atmospheric pressure drops, the ability of water to hold dissolved oxygen reduces? That combined with potential pollution as sewage storm overflows are inundated, accumulated dirty run-off from roads and decaying algae can all really take their toll on some fish. Reporting these incidents to our hotline is so important and we have many anglers and other members of the public to thank for this. If you do see any dead fish in the water, fish that look like they’re gasping at the surface or fish that are exhibiting what you think is unusual behaviour or even if their skin has a strange appearance, then please ring on 0800 80 70 60. You can do this anonymously. We will help where we can. It’s important you do this sooner than later as we can help prevent problems from escalating. Our first priority is to prevent the situation getting worse. What does the Environment Agency do? My colleagues and I can use a range of options to save fish where possible. These include mechanical and chemical aeration which helps to re-oxygenate the water, diverting fresh water into a polluted reach, monitoring probes so we can detect improvements and even if it is absolutely necessary, we may consider removing fish from stricken waters in order to relocate them and enable them to thrive elsewhere. If fish are lost through pollution and restocking is the best way to restore a fishery or kick-start recovery, we will place an order with our fish farm at Calverton. But we would rather it didn’t come to this… If the incident has been caused by pollution or another environmental offence and an offender can be identified, we will follow this up with enforcement action and may prosecute. I remember one particular incident at a fishery in Skelmersdale in July 2015. It was an unusual one and differed from the usual call of ‘fish in distress’. An algae bloom had resulted in 95% coverage of the water with a thick, red algae layer. The angling club leasing the pond called with concerns over fish welfare as they’d noticed fish jumping and swirling in the algae layer and appeared to be struggling. The thick algae layer was reducing oxygen exchange and causing low dissolved oxygen. As soon as the call came in, aeration equipment and a dissolved oxygen meter were loaded on to our 4x4. Once at the pond, it was clear some fish were very distressed and the dissolved oxygen was lower than it should have been. Aeration equipment was deployed to disperse the algae and aerate the water. This safeguarded the fish population and prevented a fish kill. Last year, my team responded to many incidents and we saved more than 20,000 fish. Knowing that we have reduced both the impact on the environment and on anglers’ enjoyment of their sport in our area really makes the job worthwhile. However, half of these incidents were at still waters and although we try to help where we can we encourage private fishery owners to be resilient and take their own precautions; it’s better for their fish, for your angling and for their business. You can read more here and even learn how to make your own aeration equipment if you’re a fishery owner. For more information on the work we do to protect and improve fish and fisheries please go to GOV.UK to see our Annual Fisheries Report. Here you can see a breakdown of what we’ve been doing with rod licence money in Cumbria and Lancashire and all our other areas. Hello I'm not sure if I am contacting the right dept, last week my wife saw 2 dead Crayfish floating on the surface of the canal local to me in Whittington Nr Lichfield staffs close to the bridge number 78.
my wife could not say what variety they were. If you see any crayfish (alive or dead) you can report the sighting to the local biodiversity team please call us on 03708 506506. I have however sent an email to the team on your behalf. If the welfare of fish so important to you then why aren't you helping the fish in Liverpool's parks ? If the health of the fish so important to you why are you not helping the fish in Liverpool parks ? Fished Clearwater fishery just off m6 in Cumbria last week to arrive to 6 dead fish and another at end of day. No discernable worry was shown by staff. Will not be going there any time soon. Needed aeration badly. Janemoor Pond (SO43 7HH) in the New Forest currently has 1000's of fish in distress, Pond has reduced in size by half and is now only 12" deep and with the amount of livestock drinking out of it I would give it 2 weeks at most before it has completely dried up. you can walk in it and your legs are surrounded by fish gasping for air. 4/5 week ago I visited the river Weaver navigation at Sutton Weaver the river was covered in raw sewage I travelled back to Acton Bridge and the river was covered in raw sewage there was people ant both venues who said they were going to report this to the E A. United Utilities had discharge the raw sewage have you taken any action against them. there are 2 rowing clubs in this area if any of the rowers were to go into the water they are at risk of very dangerous diseases. Action is needed from you if you caught me fishing without a licence you would soon take action and have me in court now you should follow correct pollution laws from the E.U. and get them in court. When walking in Bushy Park over the past few days, I have seen many fish in distress in the park, suffering from lack of oxygen in the water. It is the stretch behind Petavel Road in Teddington where the perimeter footpath passes by an expanse of water (not far from the rugby pitch and cricket pitch. I think the fish urgently need the water to be re-oxygenated. I will try to let the Bushy Park management team know too. We take reports of dead fish/fish in distress. Please call our incident team on 0800 80 70 60. They will need to take further information from you to put a report together. We will then be able to allocate this to a local environment officer to investigate further. small stream coming into the main lake at the north end adjacent to the play area, many dead fish, yesterday only a couple dead, today all dead may be a couple of hundred. The stream enters the lake via a small culvert through which the fish have been chased by Goosander ducks. Oxygen depletion has been suggested but to me that seems wrong as the water is cold and running, I would expect that in hot weather, plus the fact that all the fish are dead. I also saw a Kingfisher on the stream which is another worry.